Unlike anything else I’ve ever seen, Zion National Park is a breathtaking slice of the Utah desert. The more miles we put on the truck, the more apparent my personal theme of this road trip became. To overcome one’s fear is not the same as embracing one’s fear. As the weeks passed and our visit to Zion National Park inched closer and closer, the more nervous I felt. 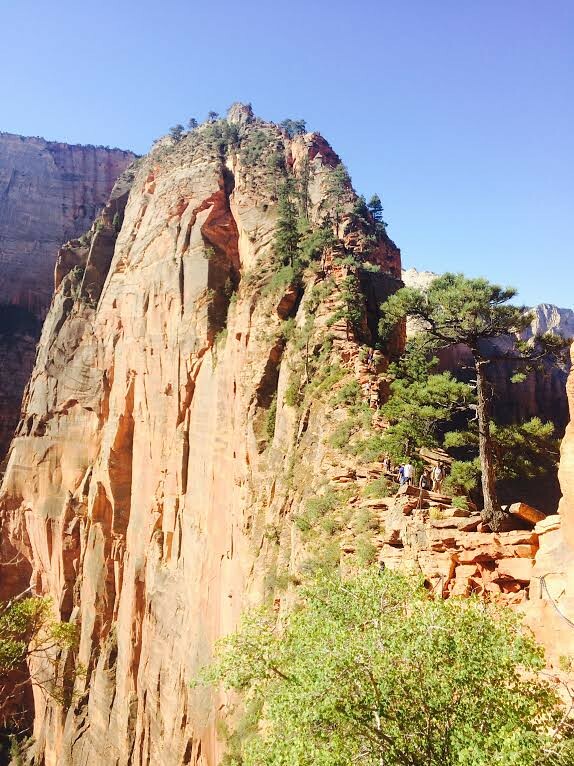 More than anything, I badly wanted to hike to the summit of Angels Landing – arguably the park’s pièce de resistance – but its reputation certainly preceded it. As we approached the park entrance from the east, my anticipation mixed with my fears to create a potent elixir at my core. 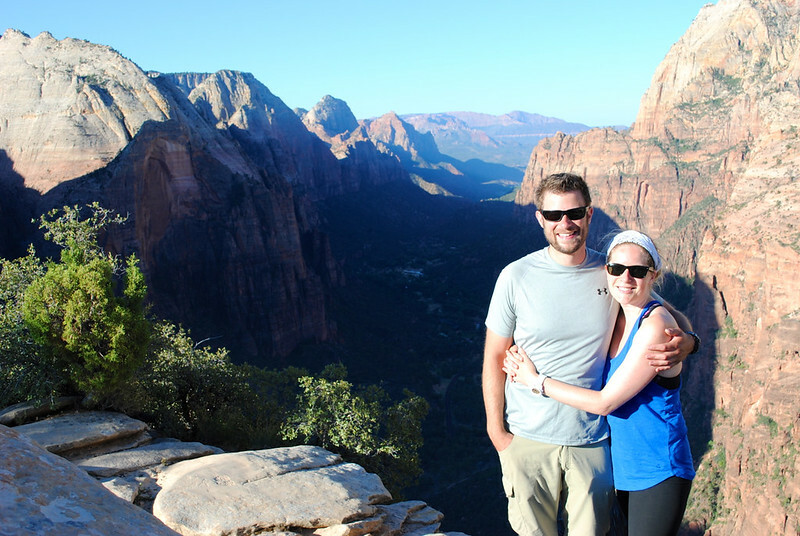 We had traveled more than 2,000 miles to experience Zion and I wasn’t about to waste what could have been a once-in-a-lifetime opportunity. Much like our adventure to Delicate Arch in Arches National Park, we once again woke while the rest of the campground was still fast asleep. An expanse of stars stretched above our tent and, in the silence of the early morning, we laced on our shoes and headlamps before making our way to the Zion National Park tram. The first tram of the day left the Visitors’ Center at 6:00 a.m. and we were the first ones on board. 20 minutes and several stops later, the bus driver pulled over at The Grotto to drop us and a dozen others off in the shadow of Angels Landing. 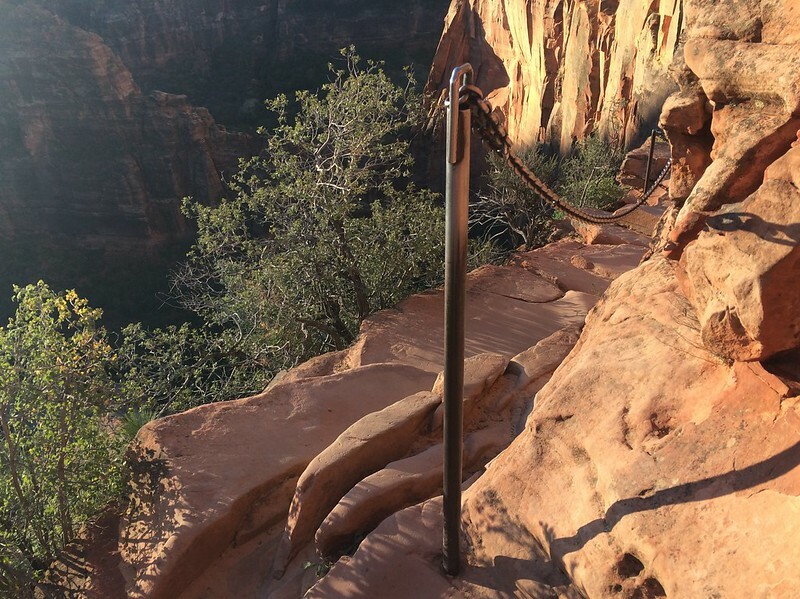 Stretching over 1,400 feet into the sky, a 2.5-mile trail snakes from its base to its apex. Steep and winding, the trail is strenuous at best and at times downright terrifying for some. The formation itself is eerily shaped like a tombstone with a rounded crown and drop-offs of more than 1,000 feet on either side. 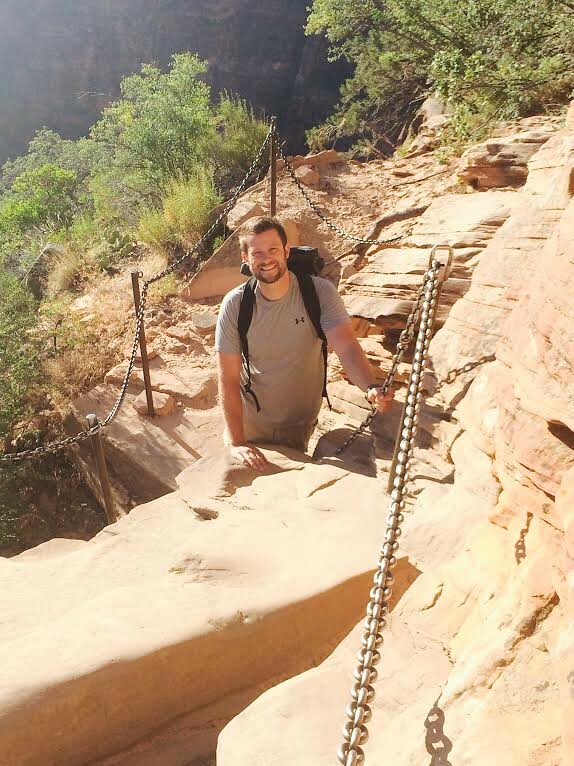 In some places the trail is merely three or four feet wide with nothing but carved footholds and bolted chains to hang on to. 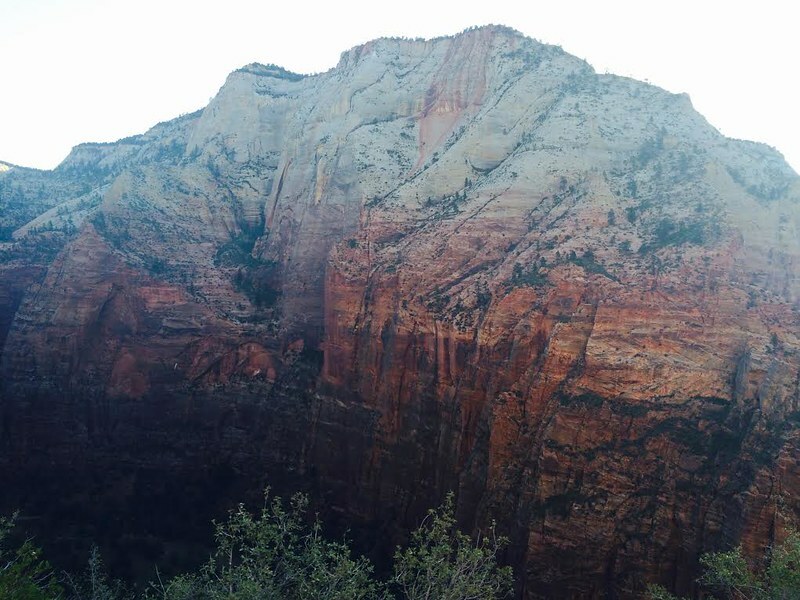 Angels Landing earned its name because it was said that the peak is so high and isolated that only angels dare to land there. All the fears, the nagging worries, and the unknown expectations that plagued me before arriving simply disappeared as I ascended the trail. 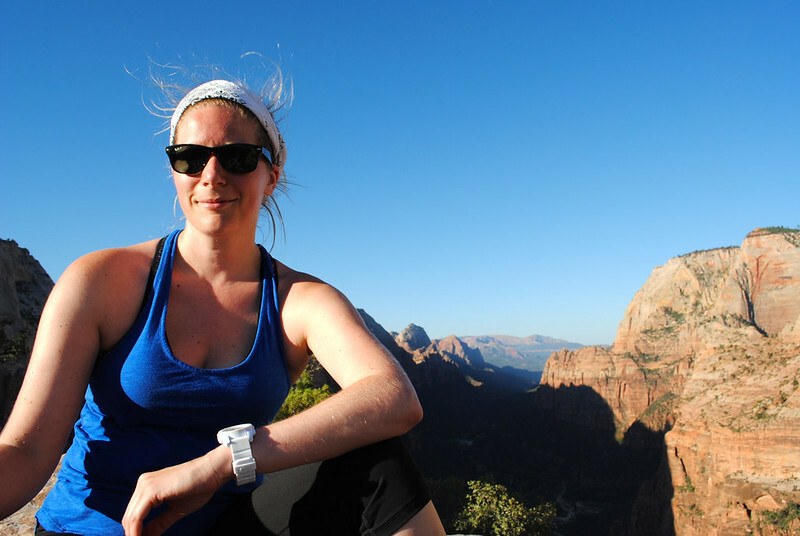 It took us a little over an hour to summit Angels Landing, an effort that was handsomely rewarded at the top. I felt excited and thrilled and accomplished. 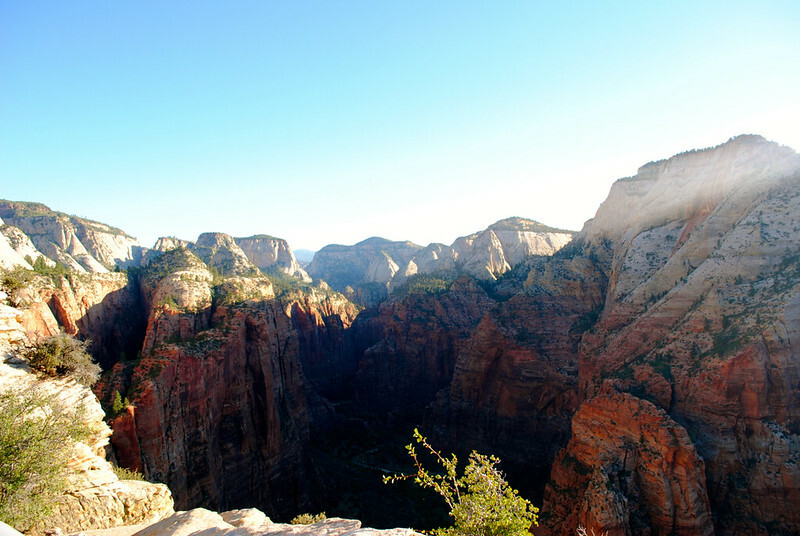 Sitting at the top, gazing across Zion Canyon, is something I will always remember as one of my proudest moments. 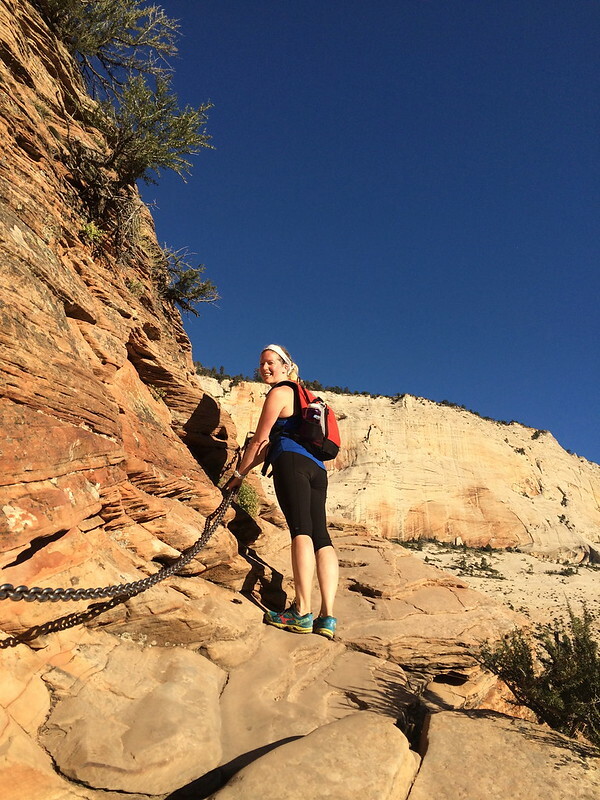 By the time we found ourselves back at the base, it was the right time for a belly-busting breakfast, so we hopped on the tram back to Zion Lodge for hot coffee and eggs Benedict on the upper deck. It was the perfect refueling we needed for a quick jaunt to Emerald Pools before our final adventure of the day. 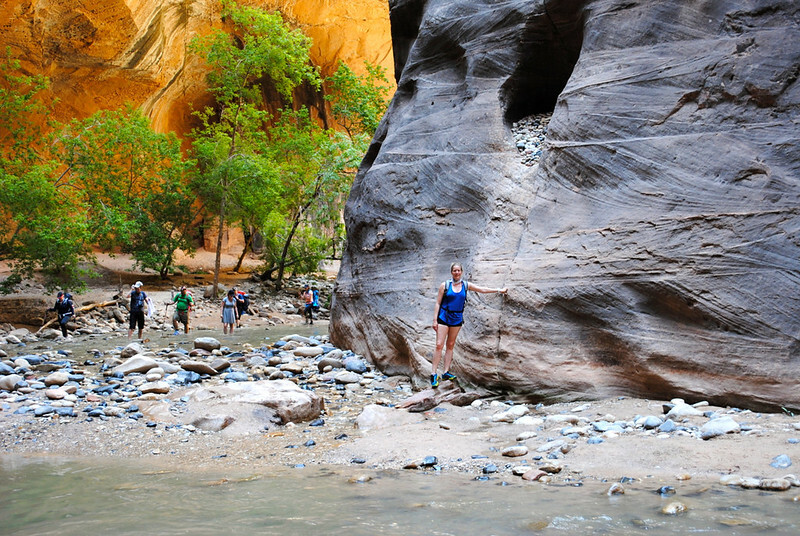 There are two reasons most people visit Zion National Park: one is Angels Landing and the other is The Narrows. 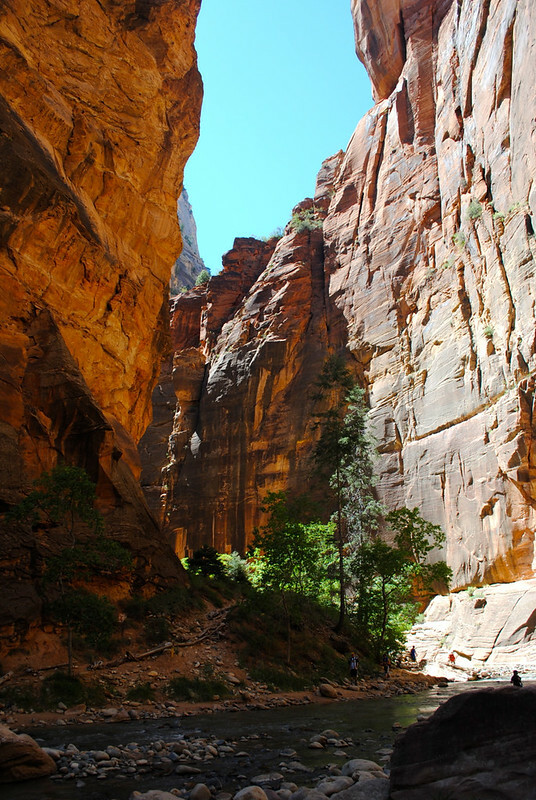 A 16-mile gorge at the north end of Zion Canyon, The Narrows curves back and forth between three-storey sandstone cliffs beyond the Temple of Sinawava. While at times the Virgin River rushes through it, it’s normally a calm stream usually no more than knee-deep. 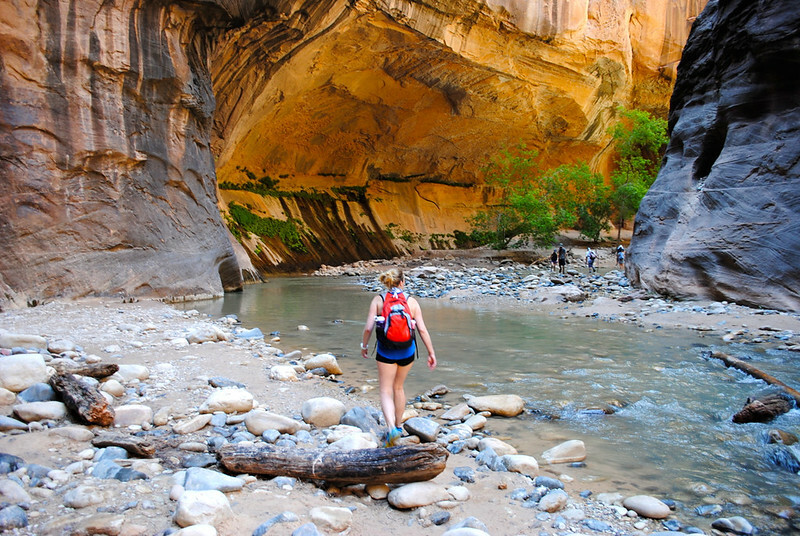 It’s a popular spot for many visitors to Zion National Park, and those tackling The Narrows should be prepared to wade through both water and people to find some solace within the canyon walls. Many rent water shoes and hiking sticks, but we didn’t hesitate to head out in our cross-trainers while forgoing walking sticks altogether. As we made our way through the first couple of miles, we spent a lot of time dodging people and repeatedly emptying our shoes of sand. Because the gorge is so long, you can spend as little or as much time as you’d like exploring, and there’s only one way out so it’s very difficult to get lost. Once we reached three or four miles in, other people became more sparse and we finally felt like we had a bit of privacy. Despite the shadowed walls and cool water that rushed around our ankles, the intense heat of a July day in Utah ensured that we stayed warm. 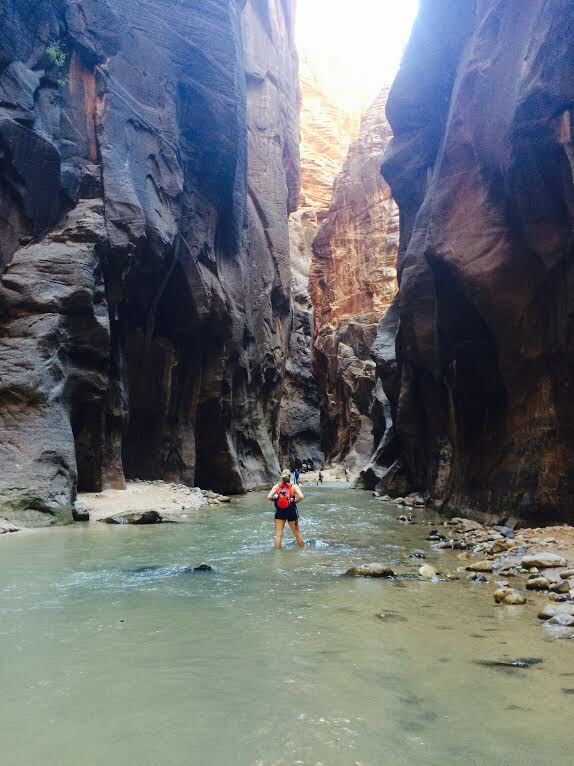 In all, we spent close to four hours exploring The Narrows. I traced my fingers along the sandstone walls, splashed water onto my face and around my neck, and breathed in the sweetness of every moment we spent within that canyon. If we are lucky, in our lives we get a handful of opportunities that have the ability to change who we are at our very core. It’s up to each of us whether or not we want to seize those chances or let them slip out of our fingertips. American author Edward Abbey said “Wilderness is not a luxury, but a necessity of the human spirit.” I believe this wholeheartedly. 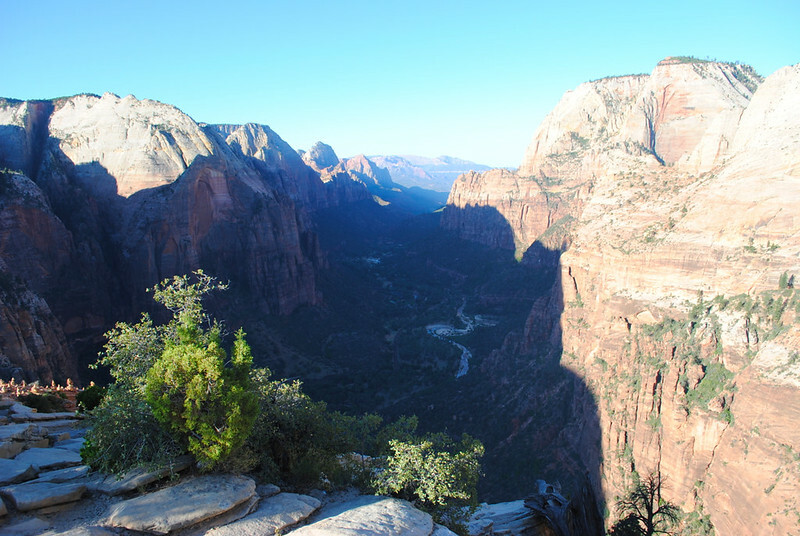 Within Zion National Park, I found that luxury, that necessity to my human spirit. It revived me, it ignited my heart, it breathed new life into my very essence. 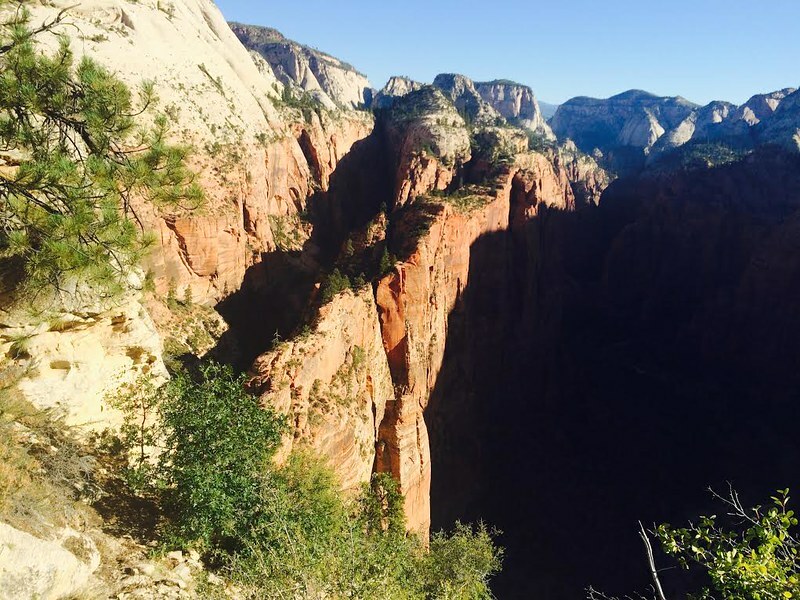 *Zion National Park, while stunning, is home to many hidden hazards. Flash floods, steep drops, heat stroke, sun stroke, and even hypothermia are very real dangers. It’s vital to pay attention to all posted signs and instructions from park rangers. While hiking, exercise extreme caution, carry a minimum of 2L of water per person, and be prepared for all weather conditions. 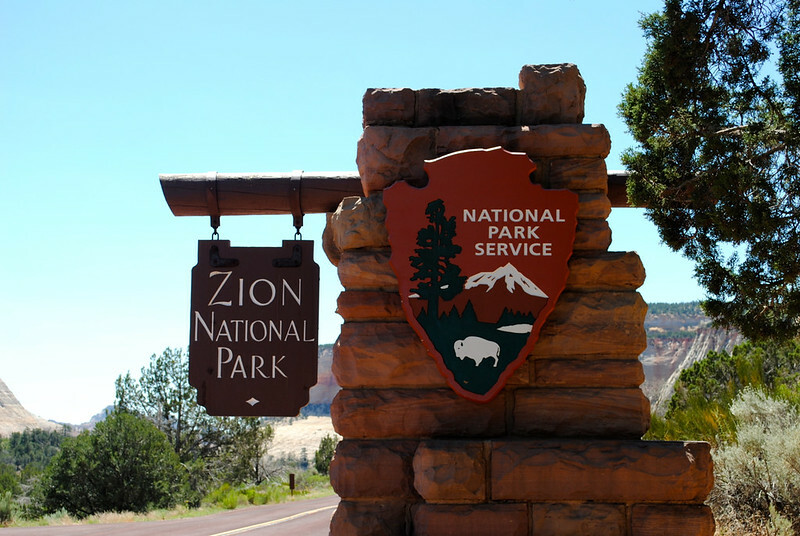 For more information, please refer to Zion’s Safety Information page. Would I Stay Again? : Possibly – only if there was no other option. By the time we booked, only walk-in sites were left and they are all exposed and in the direct sunlight. Summertime in Utah is no doubt excruciatingly hot, and our tent baked all day. Night time offered no relief from the heat. Really enjoyed “tagging along” on your roadtrip! Arches stole my heart at 17 and inspired much creativity. Moving from Whalley to Utah in 10th grade was super weird but discovering the red rock country blew my mind after growing up in a totally different environment. Kinda saved me as i roamed all around the backroads. Much power in the canyons as you discovered. Also, i agree with “im afraid of falling from heights” indeed, its not the height, its the fall that matters. 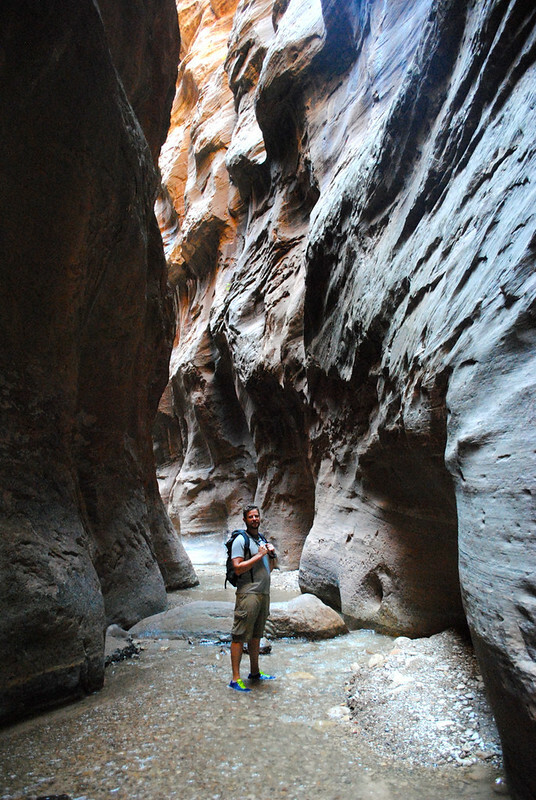 Now, start reading Edward Abbey’s Desert Solitaire immediately and remond you to send ya a link to a short story about getting trapped in a flash flood in Escalante Canyon years ago.